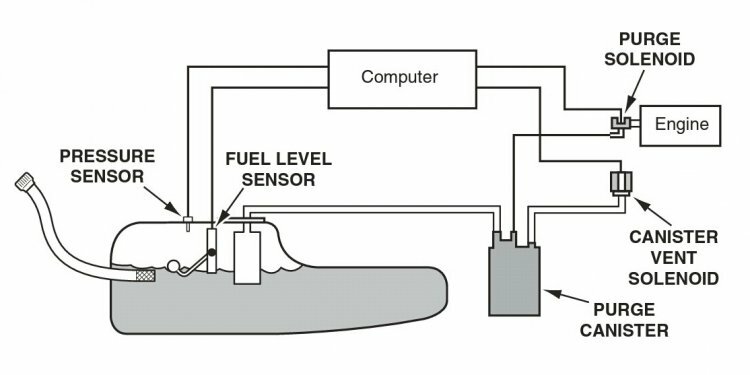 The code P0455 is set when the engine computer recognizes a large leak in the Evaporative emission control system (EVAP). The vehicle's EVAP system is sealed, it's main purpose is to prevent gasoline vapors in the fuel tank from escaping into the atmosphere. The most common culprit is the gas cap that is left open or not closed properly, although there could be other problems, read more below. - In some Nissan and Infiniti vehicles including Altima, Rogue, Versa, Pathfinder and QX4, the code P0455 is often caused by a bad vent control valve. The vent control valve is located at the back of the vehicle, at or near the charcoal canister. It can be tested by applying battery voltage to the vent control valve terminals. When voltage is applied, the vent control valve should produce and audible click. If there is no click, the vent control valve must be replaced. For some models, the vent control valve design has been modified. An updated part can be ordered from a Nissan dealer. This thread at TitanTalk.com shows how it looks. Nissan also has published a technical service bulletin (TSB) for the 2005-2007 Pathfinder recommending to install a filter kit if the code P0455 is caused by a faulty vent control valve. - In some late 90's to early 2000's Dodge, Jeep and Chrysler vehicles, cracks in the rubber hoses and elbows that connect some of the components of the EVAP system are fairly common to cause the code P0455 and other EVAP codes. The rubber hoses are typically used to connect the rigid plastic lines to the service port, canister and other parts. Some rubber hoses are located under the hood, others are under the car and close to the charcoal canister. The cracks could be small and difficult to find. The diagnostic process requires careful inspection. Thanks to the authors of this thread at WranglerForum and this thread at DodgeForum for posting the pictures. - A faulty purge valve is common to cause the code P0455 in some Hyundai vehicles. In Hyundai technical literature it's called Purge Control Solenoid Valve or PCSV. - According to the Mazda TSB, in some 2004-2006 Mazda 3 and Mazda 6 vehicles, the code P0455 could be also caused by a stuck-open purge valve. The purge valve can be tested with a vacuum pump, see the photos here. - In many Volkswagen and Audi vehicles, the faulty purge valve (N80 in VW literature) commonly to causes the P0455 and some other codes.